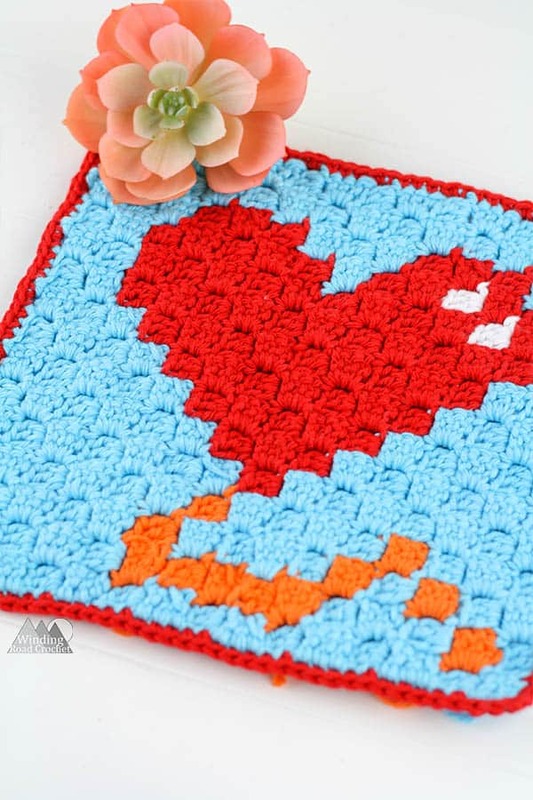 The Heart Balloon C2C graph can be used to make a large pot holder or wash cloth. This is the February edition of my 12 months of Corner to Corner Crochet. I will be releasing a new graph every month. You can find January’s Cup of Cocoa Graph Here! The Heart Balloon C2C Graph is designed to be easy for beginners trying out C2C crochet graphs or charts. In this post you will find the graph, written chart, and tips for how many bobbins to use and where you will use those bobbins of yarn. If you are brand new to Corner to Corner Crochet, check out Corner to Corner for Beginners.There you will find photo and video tutorials for Corner to Corner Crochet, plus practice patterns! If you want to be the first to know of new patterns from my blog and the release of the other 12 Months of C2C graphs, sign up for my email newsletter so you don’t miss a thing! Want more Corner to Corner Crochet? Check out some of my favorite design below! When doing corner to corner crochet, I love to use the Printable Yarn Bobbins to keep my project tangle free! Of course Corner to Corner crochet is not the only way you can use the Heart Ballon C2C Graph. You could make the graph using the bobble stitch method or with single crochet tapestry crochet. I have seen someone make my Woodland Wonderland Blanket using 4 Single Crochet for every square on the graph. How to Read this pattern – R6: 3B, 2R, B = 3 Blue Squares, 2 Red Squares, 1 Blue Square. Since this was a smaller graph I thought I would share how I used my yarn bobbins. I like to use my Printable Bobbins to keep my yarn from getting tangled. For this graph I used 2 blue bobbins, 1 red bobbin and 1 orange bobbin. For the white did each square without carrying the yarn to the next row. You can of course use as many or as few bobbins as you would like, but this is just how I did it. Below I mapped out using different shades where I carried each bobbin. To finish this graph and make it into a washcloth I just Single crocheted around the edge. If you don’t know how to add a single crochet border, you can check out my video tutorial or my photo tutorial. For the washcloth I added the border and wove in my ends and it was done. For the Pot Holder, I made a plain 15×15 C2C square, Single Crocheted a border to that square and the square using the graph and used a running stitch to sew the two together. You can learn more about Sewing Crochet Pieces Together with my video tutorial. Now you have an adorable new addition to you kitchen! Are you going to make a Heart Balloon C2C Graph Potholder? I would really like to see your finished piece, take a picture and share it with me on any social media! Just tag me @windingroadcrochet, #windingroadcrochet, or #ourcrochetjourney. Join my Facebook Group and share your creation with the community at Our Crochet Journey Facebook Group! Written pattern, tutorials, graphs and pdfs of the Heart Balloon C2C Graph are copyright Windingroadcrochet.com. Please do not reprint or repost this content as your own, but please feel free to share this link with others. You can find more information on sharing my work with others in the Terms and Conditions Page. Oh my goodness, this is just so cute. Pinning ‘cos I just need to make this sometime! I want to sign up for the newsletter so that I don’t miss a thingh. I LOVE c2c graphans especially for kids. So please keep me updated with whatever mischief you’re brewing. I hope you do sign up. I am brewing a lot of mischief right now. I am a bit of a workaholic as soon as the kiddos go to bed.